The continuous use of the QWERTY keyboard causes pain, and I am forced to rest my fingers. While it is good to take a break, it shouldn’t be done for the wrong reason. I started to look for alternate keyboard layouts to use, and a typing tutor to practise with. Dr. August Dvorak and Dr. William Dealey completed the Dvorak simplified keyboard layout in 1932. There are five levels in Klavaro - introduction, basic course, adaptability, speed, and fluidity. After adding the Dvorak keyboard layout on Fedora, I started the exercises in Klavaro. At home I used Dvorak, while at work I used QWERTY. I was able to quickly reach 30 words per minute (wpm) with Dvorak. When I tried to go beyond 40 wpm, I was unconsciously still thinking, and using the QWERTY keyboard. To break that barrier, I switched full-time to use Dvorak, even at work. 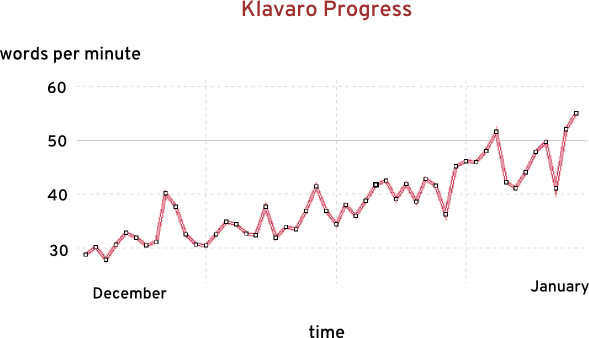 Speed was slow, initially, but after a month of practise I passed all the exercises in Klavaro. If you are not familiar with touch typing, it is best to start with Dvorak. I can now type continuously for hours, and my fingers don’t hurt. I also do take breaks occasionally.